Alwin Nikolais (November 25, 1910 in Southington, Connecticut – May 8, 1993) was an American choreographer. Nikolais studied piano at an early age and began his performing career as an organist accompanying silent films. As a young artist, he gained skills in scenic design, acting, puppetry and music composition. It was after attending a performance by the German dancer Mary Wigman that he was inspired to study dance. He received his early dance training at Bennington College from the great figures of the modern dance world: Hanya Holm, Martha Graham, Doris Humphrey, Charles Weidman, Louis Horst, and others. In 1940, in collaboration with Truda Kaschmann, his first modern dance teacher, Nikolais received a commission to create Eight Column Line, his first ballet. The work was presented at one of the events of Hartford social season that counted Salvador Dalí and Léonide Massine as honorary patrons and was well received. After teaching two years at his own studio and touring the US with dancers from Hanya Holm's company, Nikolais did active duty in the Army during World War II as a master sergeant in criminal investigation. Nikolais relocated to New York City following the war and resumed studying with Hanya Holm. Eventually, he became Holm's assistant, teaching at her New York school and at Colorado College during the summers. In 1948, Nikolais was appointed director of the Henry Street Playhouse, which had been left in a state of transition and had to be entirely re-established. He formed the Playhouse Dance Company, which was later renamed and known as the Nikolais Dance Theatre. It was at Henry Street that Nikolais began to develop his own world of abstract dance theatre, portraying man as part of a total environment. Nikolais redefined dance, as "the art of motion which, left on its own merits, becomes the message as well as the medium". He Stated "The Province of art is to explore the inner mechanisms and extra dimensional areas of life and, out of the exploration, to produce its findings translated into the form of the artist's media." It was also at Henry Street Playhouse that Mr. Nikolais was joined by Murray Louis, who was to become a driving force in the Playhouse Company, Nikolais' leading dancer and longtime collaborator. In 1956, the Nikolais Dance Theater was invited to its first of many appearances at the American Dance Festival. With this, and a number of appearances on televisions The Steve Allen Show, his total dance theatre had begun to take shape, and the company established itself in the forefront of American contemporary dance. With the company's 1968 Paris season at the Théâtre des Champs-Élysées, Nikolais' impact on dance grew internationally. Following Paris, the company began performing around the world. Here began a long artistic relationship with the Théâtre de la Ville which began in 1971 and continues now after his death. In 1978, the French National Ministry of Culture invited him to form the Centre Nationale de la Danse Contemporaine in Angers, France. 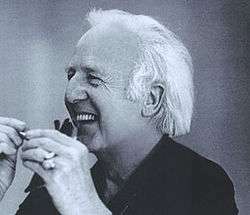 In December 1980, he created his 99th choreographic work Schema, for the Paris Opera. At the same time, his choreography for an opera by Gian Carlo Menotti was being staged at the Vienna Staatsoper. In 1987, Nikolais was awarded the National Medal of Arts, bestowed by President Ronald Reagan, and the Kennedy Center Honors, conferred during a three-day round of official Washington events, which culminated in a CBS telecast featuring the Nikolais Dance Theater. Alwin Nikolais gave the world a new vision of dance and was named the "father of multi-media theater." He received the City of Paris' highest honor, the Grande Medaille de Vermeille de la Ville de Paris, as well as medals from Seville, Spain, Athens, Greece, and 30 other cities both foreign and national as well as a special citation from New York City's Mayor, which he shared with Murray Louis. Often referred to as the American Patriarch of French modern dance, Nikolais is a knight of France's Legion of Honor and a commander of the Order of Arts and Letters. His accolades from the world of arts and letters included the Samuel H. Scripps American Dance Festival Award; the Capezio Award; Circulo Criticos Award, Chile; Emmy Citation Award; Dance Magazine Award; the Tiffany Award; and the American Dance Guild Award. In 2000 he was inducted into the National Museum of Dance's Mr. & Mrs. Cornelius Vanderbilt Whitney Hall of Fame. Nikolais was granted five honorary doctorate degrees, was twice designated a Guggenheim Fellow, and was the recipient of a three-year creativity grant from the Andrew W. Mellon Foundation. Mr. Nikolais and his work have been featured in numerous films and television programs in the US and abroad. In July 1987, Nik and Murray, a feature-length documentary film about Nikolais and Murray Louis, directed by Christian Blackwood, aired on the PBS series American Masters. Nikolais was renowned as a master teacher, and his pedagogy is taught in schools and universities throughout the world. He died of cancer May 8, 1993, in New York and is buried in Père Lachaise Cemetery in Paris. Nikolais purchased the first Moog analog synthesizer system. Nikolais employed lights, slides, electronic music, and stage props to create environments through which dancers moved and, more important, into which they blended (Dance Magazine). He would commonly use props with esthetic as well as functional purposes, for instance, a traveler moving across the stage would hide a crossing and simultaneously create a volume of motion. His production MASKS, PROPS, and MOBILES was accredited to have created and popularized modern multimedia theater (Mazo, Joseph), although, some critics rejected Nikolais work as dance, especially when Nikolais transformed the bodies of dancers by covering them in plastic bags that would stretch and change shapes in Noumenon; a section from Masks, Props and Mobiles (1953). He avoided overused themes like psychosexuality, good vs. evil, or heroes and heroines.Instead, he chose to move away from the life of the individual and focus on group action. He preferred also to develop his own style of movement, and not to replicate the moves of previous time periods or other composers. Nikolais' V artistic mandate was for meaning to be conveyed strictly through movement. He characterized his stage presentations as "decentralizing" the dancer, so that humans were only one of the theatrical elements on stage.Alwin Nikolais despised of modern dance's obsession with self. Nikolais's dance technique is a barefoot one, a tradition handed down from the days of Isadora Duncan, who, we are told, took off her shoes in empathy for the ancient Greeks. However, Nikolais does not use bare feet out of homage. To him the bare foot is practical. Its muscular and tactile functions are essential to the performance of the total body. Nor does he utilize the bare foot and then ignore it. Apparent mutilation of the body design by the termination of the costume may disturb the image and when it does, he uses whatever device will serve his aesthetic. Many such devices are primary to the concept. In "Discs," the opening dance in Kaleidoscope, the dancers wear large colored aluminum discs on one foot, which serve in various aesthetic capacities. Originally intended simply to extend the dancer's range of balance by providing a larger than normal base, they also add a vertical extension as a great "toe shoe" might; they increase motional dynamics with their added weight in swinging. The shape, color, and material were aesthetic decisions, producing moving visual elements in themselves, and the heavy aluminum gives a satisfying, large, loud clang when the dancers stomp the floor. In a section of Stratus and Nimbus (1961) and again in Scenario the dancers wear small sound-producing fiberboard circles on each foot. The use, the material, and the size of these "tappers" were aural decisions. The specific sound was the initial criteria. Although they are not seen, they do alter kinetic values by the manner in which the dancers must move to produce the desired sound. In the 1950s a black face in a cast caused a sensory blocking. The theatergoer saw race, and all the social implication that race bore at that time. Whether positive or negative vibrations ensued in the spectator's sensorium made little difference to Nikolais. The spectator whose senses were preoccupied with racial differentiation was not perceiving Nik's images. Hence, his early treatment of the face was concerned not only with varying its uni-statement but also with preventing audiences from experiencing this sensory blocking. He used makeup: purple, red, green, yellow, half a face one color—half another, as in Kaleidoscope; or strips of color following the costume design, as in Prism; or he used whiteface, as in Imago. This use of makeup does not create character, but rather design, and is a part of the total concept of the dances in which it occurs. He was notoriously well known in the dance industry because of his use of lighting. He would use light sources from every direction and level to create new shapes, spaces, and silhouettes. With his modern, new style, he felt that most music was ill suited for it. He went back to his days as an early musical composer and designed his own score on electronic tape. Within the Henry Street Playhouse, the tapes would be played over a seven speaker system distributed throughout the room to give another time and space dimension. The combination of cast, original lighting and music, with modern dance techniques, gained The Nikolais Dance Theatre a world-renowned reputation in the theatrical arts. Receiving high regards from New York State Council on the Arts, Hofstra University, Rutgers University, Duke University, Hunter College, and Brigham Young University. With his own school and theatre, he withdrew from the spotlight of the dance world, known amongst colleagues and peers as a shy, reserved individual, allowing his partner Murray Louis to deal with more public affairs. Mr. Nikolais was renowned as a master teacher, and his pedagogy is taught in schools and universities throughout the world. Nikolais, referring to his students: "Each student is encouraged toward the highest aesthetic values, and upon creative fluency and achievement, as well as technical skill. The job of the teacher is to pursue, institute and constantly anticipate the best possible activities coinciding with this idealistic thesis." The first production by Nikolais, after the creation of the Henry Street Playhouse, was called KALEIDOSCOPE and premiered at the American Dance Festival. It aired in the spring of 1956 and showcased his company of seven dancers, intensively trained by him, for the past 7 years. The next production to follow PRISM, BEWITCHED, AND CANTOS was an improvisational performance by the dancers that utilized mirrors and the specific use of score and lighting. The act was performed on four separate occasions and was different each time. TOTEM, an act centered on religion and fetish with an element of barbarism, was performed at the Fifth Festival of Two Worlds in Spoleto, Italy. The act received serious criticism. Following this, Nikolais went the complete opposite direction for his next performance, IMAGO. This act was meticulous and orderly; the performers were placed in similar make-up and headdress to accentuate unity. A much larger production, SANCTUM, showcased 27 performers, compared to the standard 10-15 Nikolais commonly used. This act dealt with opposites: natural vs. man-made, reality vs. imagination, primitive vs. sophisticated. The performance sold-out for 6 straight weeks in New York. Dance Theatre of Alwin Nikolais, Company Publications, Alwin Nikolais and Murray Louis Papers, MSS. 181: Alden Library, Ohio University. Mazo, Joseph. "The Nik of Time." Dance Magazine July 1993: p. 28. ↑ "Archived copy". Archived from the original on July 17, 2010. Retrieved February 21, 2012. Nikolais-Louis Foundation for Dance, Inc.
Archival footage of Alberto Del Saz and Peter Kyle in Nikolais's Mechanical Organ, performed in 1996 as a part of the The Magic of Alwin Nikolais at Jacob’s Pillow Dance Festival.